Little Troopers is celebrating after sending out its 3000th Separation pack. 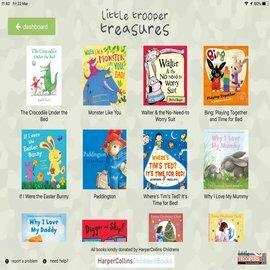 The unique resource created by Little Troopers has helped thousands of British Armed Forces children based across the world. World Map with stickers giving the child a place to plot where they have lived with the military, where they have been on holiday and where their serving parent has been. A space for their Mum or Dad’s details and picture. Chuff Charts – 10 monthly charts that are generic and can be used for just one month at a time or an entire tour providing flexibility to count down or the time frames that works for each family unit. There is also a space for notes so the child can share their memories of each month with their Mum or Dad when they get home. Postcard pack – Six illustrated postcards with envelopes for the child to colour in, write on the reverse and send. Recently Christy got in touch to tell us how the separation pack has helped her family: “The pack has been fantastic for us at home. We have really noticed how positive it is with our two girls who now recognise time conception. This is our first six month tour in 10 years and with lots of battles along the way (Adam was injured in Afghanistan 09 and then battled PTSD for three years) we are quite overprotective of each other so were extremely anxious. 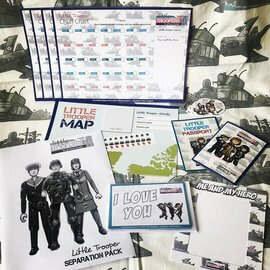 The separation packs are available to buy from the Little Troopers online shop for just £9.99 (plus P&P). You can also check if your welfare unit or HIVE stocks the pack as many place bulk orders with the charity ahead of a unit’s deployment. We love to see photos of your deployment walls, have a look here to see some that have been sent to us already.